We’ve got hold of a bunch of soundtrack albums for the new film Kidulthood which is out nationwide now. Enter the comp’ and you might win a copy! This track list is heavy. 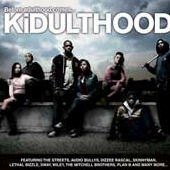 The soundtrack to Kidulthood features a wide range of artists including Skinnyman, Dizzee Rascal, Roots Manuva, Klashnekoff, Sway, Black Twang, Cee Why, Plan B and many more. It’s a great album well worth owning, and you can get your hands on a copy by answering this question. Prior to writing and acting in Kidulthood, what television series did Noel Clarke star in alongside Billie Piper? E-mail in your answers with Kidulthood in the subject field, along with your name and address. One entry per person, and winners will be randomly chosen on the 19th of March.